Are your glōtherapeutics products easily visible? They should be positioned where they are impossible to ignore. Are your testers current and clean? Containers should be cleaned on a regular basis. Check out your glōminerals display. Are there missing testers? Are the powders cracked and messy? Displays should tempt customers to try the makeup. They won't be tempted by a display that looks as if hundreds of hands have been handling the makeup: keep it as pristine as possible. Take advantage of our Point of Purchase displays (ex. 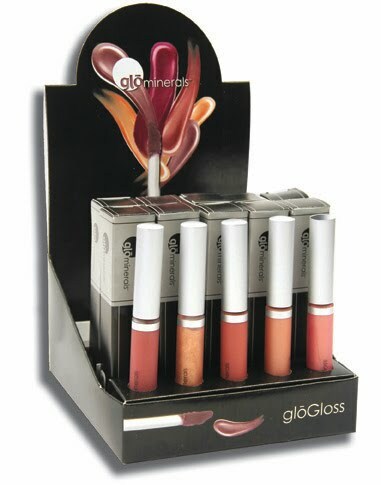 right: gloGloss POP display): how often do you add a product to your basket because it is displayed near the register? A few more lip glosses or lipsticks every day adds up! Look around your retail space as if walking inside for the first time. Would you be tempted to buy?